Bill Gates, Condoleezza Rice, Jerry Brown. CEOs, politicians, representatives and scientists. World leaders convened Thursday and Friday at the Hoover Institution for the inaugural Global Energy Forum to discuss the future of energy worldwide as the field continues to undergo major changes. Energy engineer and philanthropist Jay Precourt ’59 M.S. ’60 launched the conference — which was originally known as the Vail Global Energy Forum — in Vail Valley, Colorado in 2012 with the goal of advancing public understanding of energy. 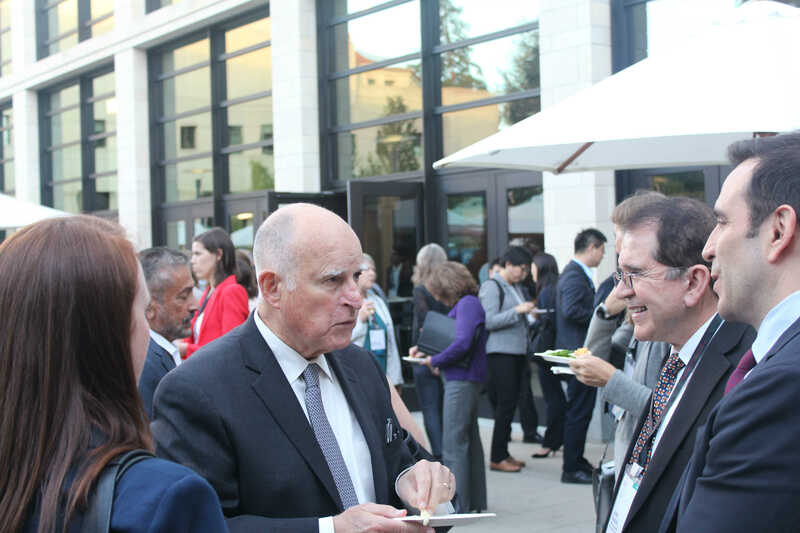 This year’s Global Energy Forum, convened by Stanford’s Precourt Institute for Energy, marked the beginning of a new era for the event following a permanent location change to Stanford. The Forum aimed to address global energy policy and practice, with energy leaders from China, India, Europe, Saudi Arabia and Japan in attendance. Leaders of the event said they hope that Silicon Valley’s ecosystem of innovation will bring an influx of new ideas to the Forum for years to come. Part of the reason for the event’s relocation to Stanford, according to Majumdar, was to fill in gaps in the dialogue around energy policy, as the event directors regarded Silicon Valley as an ideal incubator for technology and innovation. “If you want to take this long-term, Stanford would be a more suitable place to have that dialogue,” Majumdar said. According to Precourt Institute co-director and energy resources engineering professor Sally Benson, another major reason for moving the event was to better engage students. This year, 75 students from Stanford and other universities were invited to the conference to bring in a youth perspective on the issues at hand. Speakers at the Forum discussed a wide range of topics, including cybersecurity, investments and battery research in the energy realm. 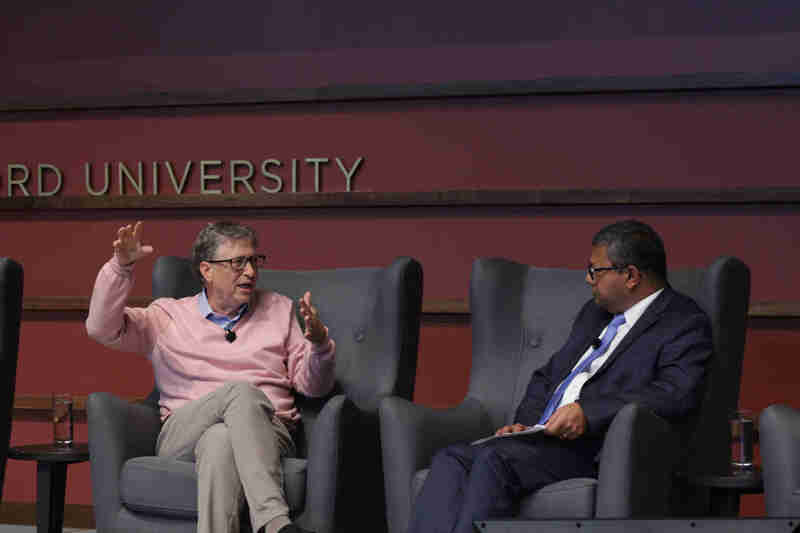 The diversity of topics was intended to spark collaboration between global thought leaders in industry, government and academia as well as to bridge divides between innovation, finance and global policy, event organizers said. In the Forum’s opening remarks, Majumdar cited the late Stanford lecturer and Intel co-founder Andy Grove, saying that the world has reached a strategic inflection point such that interdisciplinary work in the energy sector is imperative for creating an “insurance policy” against disaster. A series of panels and talks followed the conference’s opening remarks. One such panel featured a discussion on entrepreneurship conducted by a variety of founders, including ones from DBL Partners, Bloom Energy, SunPower and Opus 12. Keeping with the theme of innovation, the Forum’s networking lunch was accompanied by a half-day Innovation Showcase which featured a variety of startups and seasoned entrepreneurs — mostly located in the Greater Bay Area — showcasing a variety of new technologies in the energy space. One of the many companies at the showcase was Sylvan Source, a startup working on a thermal water treatment system to drive water treatment in a more efficient way. “Each company here has a value proposition that can be compelling to a range of the companies that are here at the Forum,” said Sylvan Source’s Chairman and CEO Laura Demmons. 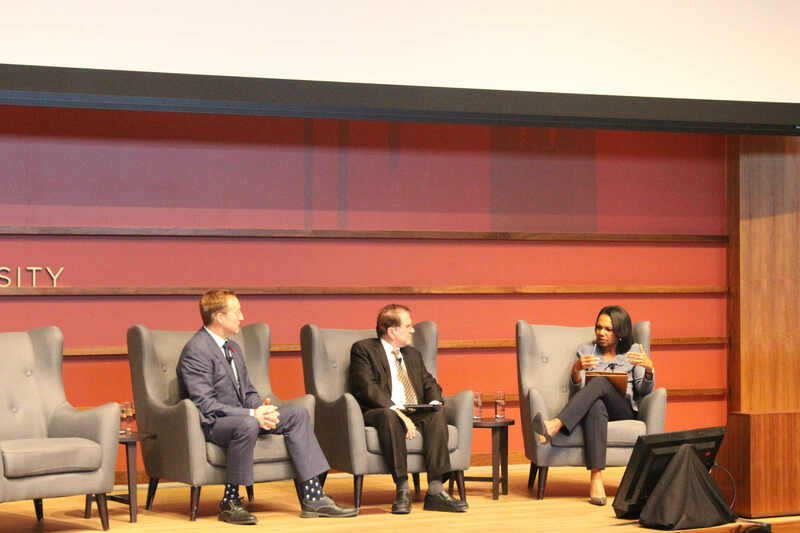 The theme of global interaction continued through the day, with panels chaired by notable Stanford faculty including former Secretary of State Condoleezza Rice, former Secretary of Energy Steven Chu and former Secretary of Defense William Perry. The first panel chaired by Rice featured Abdallah Al-Mouallimi M.A. ’83 — a permanent representative of the Kingdom of Saudi Arabia to the United Nations — discussing Saudi Arabia’s diversification of energy, destabilizing forces in the Middle East and the country’s future in energy, among other things. Al-Mouallimi also predicted that Saudi Arabia will serve as a model for other countries that hope to export different types of energy, including solar. In Rice’s second panel, the focus shifted to North America. The panel included former Canadian Minister of National Defence Peter MacKay and Jamie Parada, director general of the Nuevo Leon Institute of Innovation and Technology Transfer. The dialogue focused on a number of energy issues and recent progress made on them by the United States, Mexico and Canada. MacKay explored the ideas of carbon taxes and North American emission control standards while Parada advocated for the use of innovative technologies to develop a smarter electricity grid. “We need to take care of the environment and comply with the obligations that we have in front of humankind,” Parada said at the panel’s conclusion. In an interview with The Daily, Rice said that North America has become a significant player in energy markets in recent years. “Being able to put North America in this more international context is a very important idea,” Rice said. She argued that there are two types of countries in the context of energy: suppliers and consumers. While day one of the forum focused primarily on policy and innovation, much of day two revolved around technology and the pathway from new ideas to global impact. After a morning filled with technical talks on battery research, autonomous mobility and electrical vehicles, the afternoon featured a series of talks on energy investments and finance. In a panel moderated by Benson featuring Bank of America Chairman and CEO Brian Moynihan, discussion explored the need to modernize energy and invest in energy efficiency. From corporate green bonds to partnerships, Bank of America has focused on long-term energy investments for many years and has served as a leader in terms of corporate renewable financing, the speakers said. In Moynihan’s eyes, much of the solution will ultimately revolve around deploying more capital to clean energy and innovation. In the second-to-last panel of the Forum, Bill Gates, chairman of the Breakthrough Energy Coalition and co-chair of the Bill & Melinda Gates Foundation, spoke about his views on a green revolution, nuclear energy and recent optimism from the financial sector. For Gates, traditional finance — with spreadsheets and numbers — isn’t the solution. “There is no substitute for how the industrial economy runs today,” he said. The real question, Gates said, is which country will take change in reducing greenhouse gas emissions. He said that developing countries, such as India, won’t be willing to pay a premium price on non-fossil fuel energy, so wealthier countries should work to reduce their own emissions. Globalism remained relevant in Gates’ discussion of nuclear power. As a proponent of nuclear power, Gates advocated for the U.S. and China to work together. To close out the Forum, Majumdar, Chu, Perry and Hoover Fellow George Shultz — who has held four different federal cabinet posts — sat down in a panel to reflect on the two-day event. Chu expressed support for the development of new technologies, science and innovations, while Perry called for mass education on global energy issues and Shultz advocated for renewed enthusiasm about finding energy solutions. “We’ve got to get a sense of drive into the world community,” Shultz said. Contact Vincent Xia at vxia ‘at’ stanford.edu. An earlier version of this article incorrectly stated that the first Vail Global Energy Forum (as the Global Energy Forum was previously known) was held in 2011, when it was in fact held in 2012. The Daily regrets this error. Hailing from Chapel Hill, North Carolina, Vincent is hoping to apply his diverse background to a future career in energy. But whether it's STEM, humanities, business or politics, Vincent writes for The Daily because he wants to connect people — and Local News is a way for him to do just that. Contact him at vxia ‘at’ stanford.edu.